File Transfer Protocol (FTP) is a standard network protocol used to transfer files from one host to another host over a TCP-based network, such as the Internet. FTP is built on a client-server architecture and utilizes separate control and data connections between the client and server. Enable FTP Service Select the check-box to enable the FTP service. The current state of the service is displayed as “Service is stopped” or “Service is running”. Protocol Check Enforce SSL if you want to use the FTPS protocol for a more secure connection. Anonymous For security reasons, anonymous is best disabled. If you want to grant access to anonymous users, enable Anonymous and if you want to grant these users write access as well, also enable Writable. Port By default, FTP uses port 21 but if this port is already in use by another service or it is blocked on your network, you can change it to any other port from 1 to 65535. Passive Port Range By default, the passive port range is set to 0 and when FTP is used on the home network, this setting can be left at default. To help with port forwarding for remote FTP access, set a range of about 50-100 ports (it's best to choose ports >=50000). On your network router, make sure to forward the same range of ports. Public Folder Enable this option to restrict access to the public folder to anonymous users only. When enabled, regular FTP users can only see their own private folders. 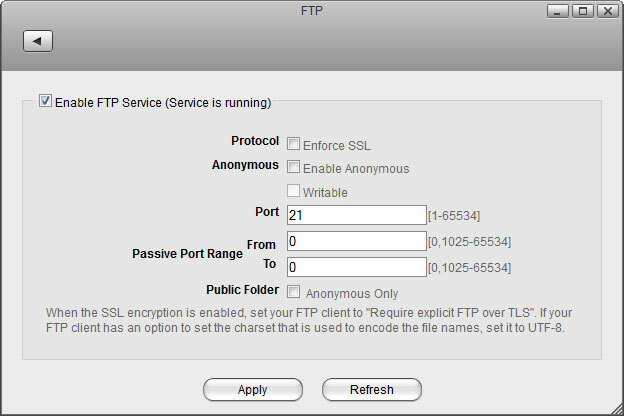 If the anonymous user is disabled and the public folder is enabled only for anonymous users, no FTP users will be able to see or access the public folder.